A First War Trio to Lieutenant Frederick Medway - 1914-15 Star (LIEUT. F. MEDWAY., R.N. 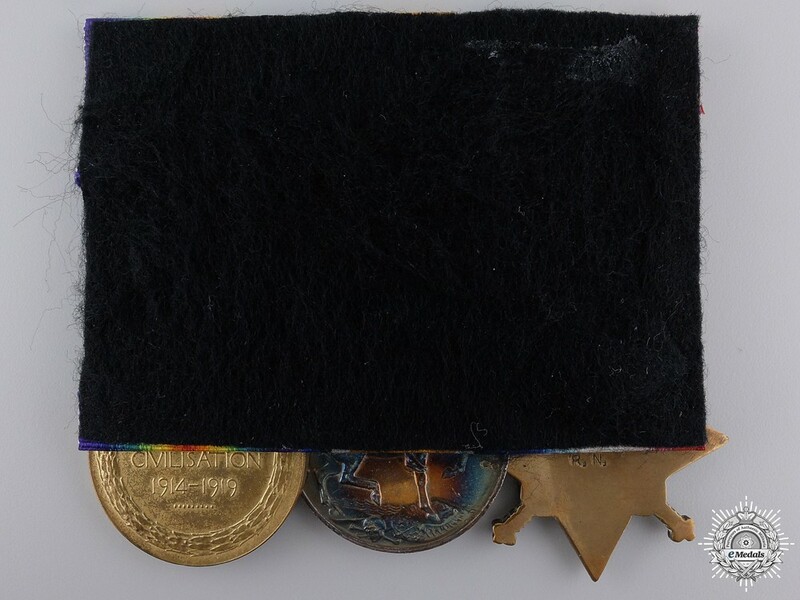 ); British War Medal (LIEUT. F. MEDWAY. R.N. ); and Victory Medal (LIEUT. F. MEDWAY. R.N.). Naming is officially impressed. Court mounted, tarnishing evident on the BWM, light contact, near extremely fine. Accompanied by a duotang folder with his military biography and eleven black and white ship photographs. 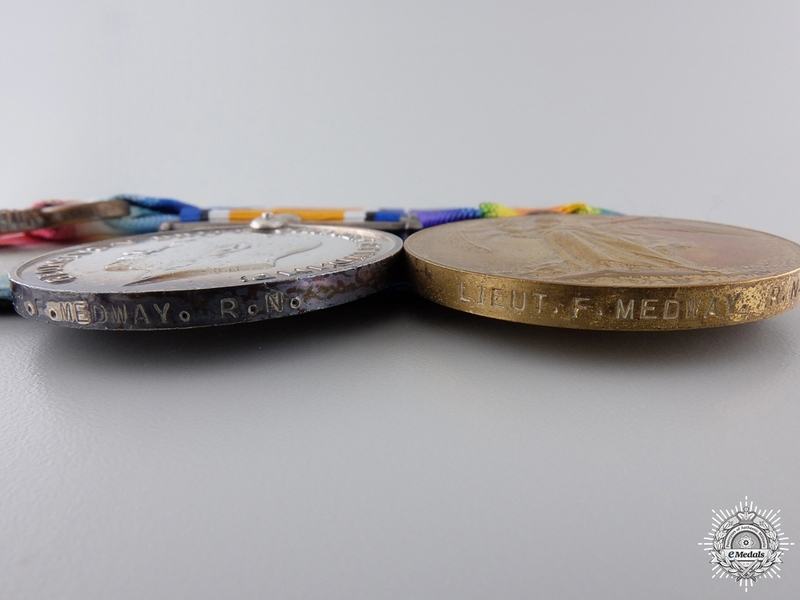 Footnote: Frederick W. Medway was born on September 10, 1881 and joined the Royal Navy on August 28, 1913 as a Mate. His first posting was to the Orion-Class Battleship H.M.S. Conqueror, which was in the 2nd Battleship Squadron of the Home Fleet, on April 16, 1914 and was with her when hostilities broke out in August. He then moved on to H.M.S. Cheerful, a C Class Destroyer in April 1915 and was second in command of this early destroyer on patrols in the North Sea. Cheerful later struck a mine off the Shetland Islands and was lost on June 30, 1917 but Medway had switched ships by that time. 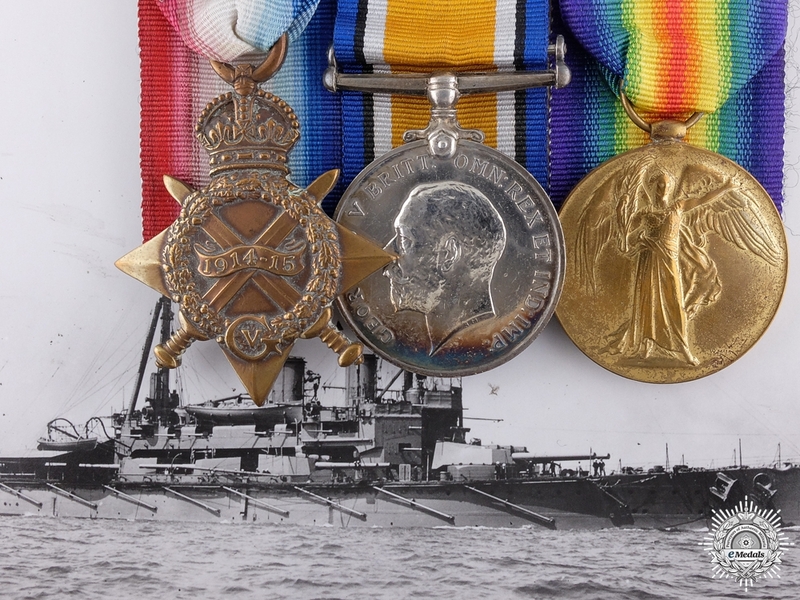 Medway volunteered for submarine service in April 1915 and was subsequently posted in July 1915 to the Submarine Tender H.M.S. Thames for training and then assigned to H.M.S. C-3 of the 5th Local Defence Submarine Flotilla. Being an old submarine, the C-3 was used for training and local patrols off Dover and east coast ports. He achieved the rank of Lieutenant on August 28, 1915. In July 1916, he was posted to the Submarine Depot Ship H.M.S. Titania, where he served on H.M.S. J-3, which was based out of Blyth in the 11th Submarine Flotilla, working from H.M.S. Talisman. After taking his Commanding Officers course, Medway was sent to the China Flotilla in October 1916 and posted to H.M.S. Rosario, the Submarine Tender based at Hong Kong in October 1917, placed in "Command of Submarines". He was stationed here in charge of three older C Class vessels, C-36, C-37 and C-38, where he was in command of one or more of them until the end of the war. 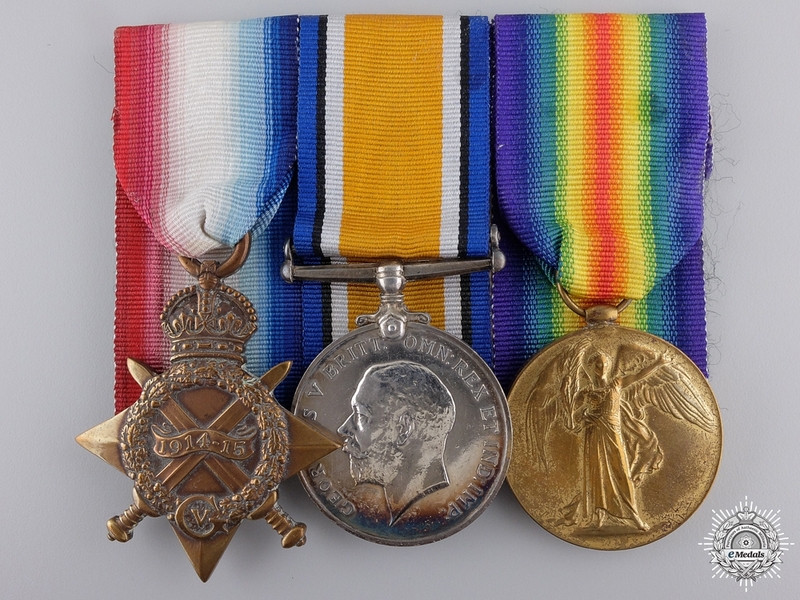 For his First World War service, he was awarded the 1914-15 Star, the British War Medal and the Victory Medal. After the war was over, in January 1919, he began serving on H.M.S. Dolphin, the Submarine Base at Gosport, where he took further courses but did not see further submarine service. Medway was described as "happy-go-lucky" by his superior officers, however, he was fined for a minor discretion and as a consequence, was put on three months half-pay, on December 14, 1919. In July 1920, he was posted to General Service with the Cruiser H.M.S. Blake, that was "Laid Up", then transferred to the Cruiser H.M.S. Blenheim, in January 1922 and finally, to the Battleship H.M.S. Agamemnon, which was acting as a tender to H.M.S. Victory at Portsmouth, on May 14, 1923. It was here that he was named Lieutenant-Commander on August 28, 1923. Medway retired from active service on September 10, 1926 as Commander (Retired).